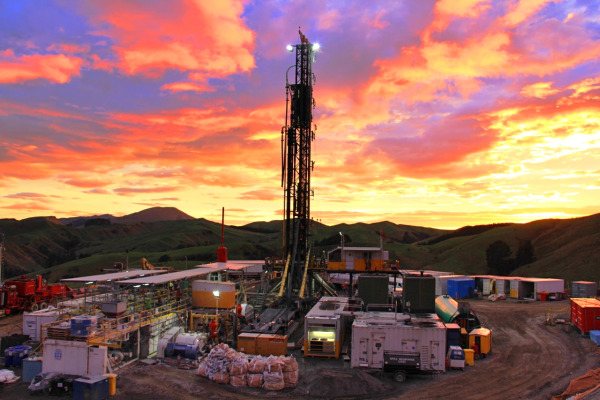 Our team is happy to report that our Ngapaeruru-1 exploration well successfully drilled through the Waipawa and Whangai source rock formations in permit 38349, an area we call Boar Hill. Early mud-log analysis returned predominantly wet gas and oil indications – meaning the presence of gas zones or soluble gas in oil – which is incredibly exciting. This was our first unconventional target in the East Coast Basin, and New Zealand’s first test directly targeting the naturally fractured Waipawa and Whangai formation source rocks, which have been estimated to contain a significant oil and gas resource. While we encountered tricky drilling conditions, everything went smoothly. During drilling we cut and recovered sidewall cores over several intervals within the 155 meters of potential unconventional oil and gas pay, sampled total organic content (TOC) and acquired gas analysis at depth. Our team, as well as independent labratories, are now undergoing a detailed evaluation and analysis to determine source rock quality, fracture identification, geochemistry, and more. This data will not only help us better understand the long term feasibility of our East Coast Basin opportunity, but it will guide our technical team to the best completion method and production testing of the well. Sunset over the groundbreaking Ngapaeruru-1 exploration well.